I’ve gotten lazy. Not just with this blog–I mean, look at how long it’s been since the last post–and not just with documenting whatever drinks-related writing and cocktail-related things I’m working on at any point in time. No, I’ve gotten lazy, in general, with drinks–which explains why, on this Mixology Monday, when the theme is tiki, I’m mixing something that goes into a damn cocktail glass. There was a time when a call-to-tiki-arms would have had me making batches of syrups and shopping for passionfruit puree or essence of guava or some other exotic ephemera, and at times I still summon that kind of energy. But nowadays, my mixological habits tend to follow the path of least resistance; unless I have a particular hankering for something, preparing for a group event or tinkering with a work-related project, most likely I’m mixing something no more ambitious than an Old Fashioned or a Martini, or punting into even easier territory by skipping straight to whiskey-rocks or simply popping open a beer. And there’s not a damn thing wrong with that. But as I said, it’s Mixology Monday, the somewhat-monthly event that pokes me into action, prompted in large part by the guilt I’d feel at shirking an event that I originally introduced in 2006–oh, the innocence of those bygone days!–and have moderated for almost six years. This month’s host, Doug Winship, selected tiki as his theme, no doubt envisioning a minor horde of home mixologists breaking out their blenders and their tiki mugs for some mid-winter escapist tippling. But the guilt! Plus, I’m thirsty! So, here’s something fairly easy, but that still fits in with the general theme: the Trade Wind Cocktail. As with almost anything else faux-tropical related, I’m nabbing this recipe from the valuable work done by Beachbum Berry. In his Beachbum Berry Remixed , Jeff notes that this drink is from the Trade Winds Restaurant on Long Island, and dates it to 1959. 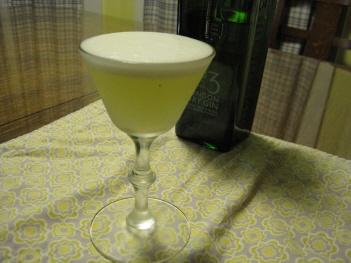 Unlike the flood of other drinks that came from the mid-century Polynesian-style era, the Trade Wind is based on gin, not rum, and really, the only touch of the Caribbean or any warm-weather locale is the three-quarters of an ounce of curacao that sweetens this otherwise simple twist on the gin sour. And as I said earlier regarding a beer or a whiskey-rocks: there’s not a damn thing wrong with that. Not all drinks that fit under the tiki umbrella are fabulous 12-ingredient formulations; there’s a need in the exotica pantheon for drinks that are smaller, drier and brighter than the syrup-laden punches that fill massive ceramic mugs. Most traditional bars, even today, have little room for tiki and its ilk (for good reason, in many cases); tiki bars, however, are more forgiving, and a basic gin-based drink tagged with a tropical moniker can still evoke ideas of a lazy day in the islands, even if the most exotic place on this particular island is within walking distance of the LIRR. Combine in shaker; dry shake until foamy, about 10 seconds, then add ice and shake again another 10 or thereabouts. Strain into chilled cocktail glass. Is that 1.5 oz of Lemon Juice a typo, This seems like a chelsea sidecar with an eggwhite. Generally like the Beachbum book, but not all the recipes are accurate in their recipes and history. http://www.cocktailcodex.com is working on it’s tiki recipes, so if atleast there are several versions you’ll know what your mixing.